How long have you been the man in the van? I started in October 2002. I back came to France after a stint as a chef in the Caribbean. I needed a job. I met a man selling his pizza van. 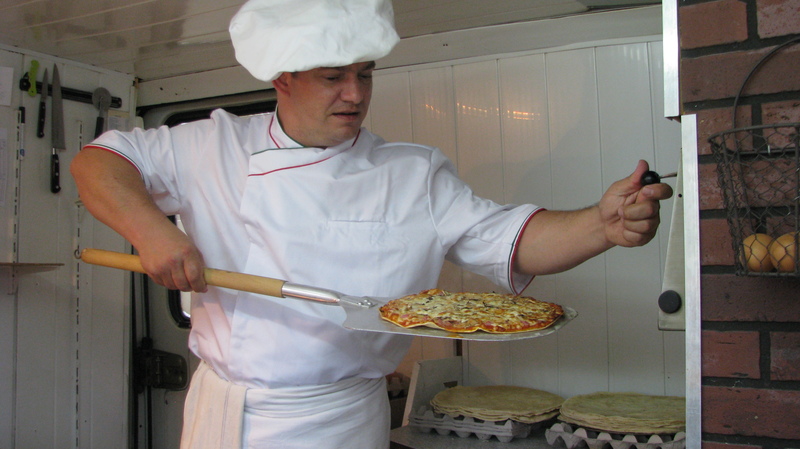 20,000 Euros later and lighter, I was running my own mobile pizza business. In a good month I clear about 1500 Euros. Wages in catering are never all that decent. I make as much working here as I would in a restaurant, but I don’t like being stuck in a kitchen, literally slaving over a hot stove, for a patron. I prefer life in my van. Out here, I am my own boss and I like chatting with the punters. This is very important. No matter how good your pizzas, if you don’t have what the French call le tchatche (the gift of the gab), the punters will never come back. Personality obviously matters. What other skills or qualities do you need in this job? You’ve got to be motivated in this game. Whatever the weather, you’ve got to be there, and it always has to be service with a smile. Have you ever seen a sad Pizzailo? Summer is the worst time. Temperatures in the van get as high as 45°c. I would also add, that it helps to know how to make pizza. Every evening you cook up at a different pitch. What makes a good pitch and how do you get one? Do you need any special permission from the local authorities? Finding a good pitch is very much trial and error. It takes roughly four months to work out the viability of a new site. As far as permission is concerned, that all depends on who owns the land and the owner’s goodwill. If the site is council-owned, you have to seek written authorisation from the local « mairie ». Quite a few of the places you cook up are villages, deep in the countryside. Was this a conscious choice, or is it simply that competition is too tough in town? This was a conscious choice, and I have to add, an astute business decision, taking pizza to those small villages where there was none. In many of the villages I work, there is no café, perhaps no épicerie or even boulangerie. When my van rolls into town once a week, it’s a bit of a party atmosphere. Let’s face it, Pizza is fun food. So, how do you make up your pizzas ? How do you decide what to put on your menu ? Well, you must have the classics : four seasons ; four cheese ; Regina ; Romana ; Napolitano and Calzone. These are very popular with the ladies. Men prefer meatier and spicier toppings like Merguez or Chorizo. After that, it depends on tastes and trends. You have to look at what the opposition are doing in pizza terms. You have to go to pizzerias and find the pizza « buzz » of the moment. There is also a regional factor in all of this. Down here, we are deep in the Berry, that means goat cheese, which is an integral part of the « Berrichon » pizza. Every region has its own pizza.. It takes three years to work out a successful and viable menu. What makes a good pizza ? Fresh toppings, a good dough and love. You can find a van on the Internet. There are plenty of companies making ready-to-use vans. 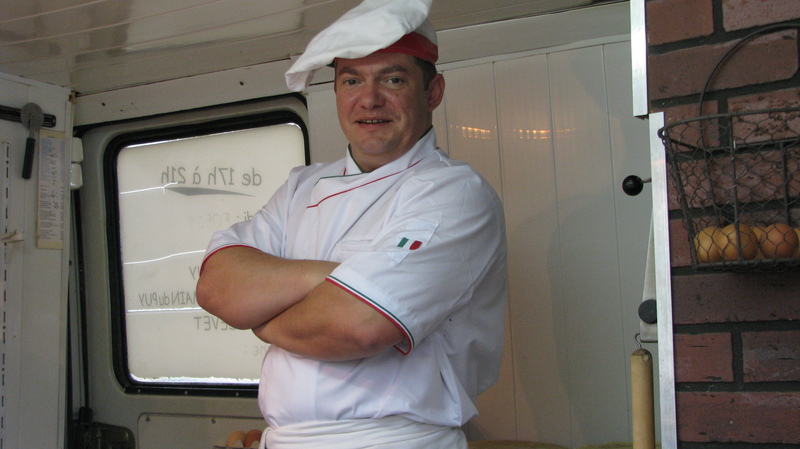 Not just pizza vans, but mobile shops for butcher’s and baker’s. You can pay anywhere between 35000€ to 60000€ for a new van. If you’re a dab hand at DIY, you can of course attempt your own van conversion. A decent second hand box van can be had for 7000€ on the Internet. Costs can be kept down by using second hand fittings like sinks, work surfaces, cupboards etc. The most difficult aspects of van conversion (according to one expert I know) are – cutting out the serving hatch and fitting the oven. If you want to make good pizza, you need a wood burning oven. A new oven will set you back about 3000€. Fitting the oven into the van is a nightmare, the oven can weigh nearly 400 kilos.